Before my mind gets tainted by book club tonight, I want to post my thoughts on the book we read. 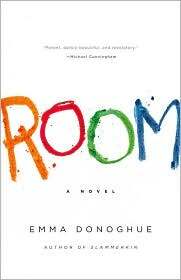 The Room by Emma Donoghue. What makes this book different is that the narrator is a 5-year-old boy named Jack. He has lived his whole life in one room with his mother, a woman who was kidnapped in college and has been held hostage in the room for seven years. Many find this book intriguing because it’s told in the eyes of this adventurous, innocent child who has never seen the outside world. He believes life is all about him, his mom, his toys, and that the characters on TV are not real people. After a while, the voice–at least for me–starts to get unbearable. Maybe it’s because I have yet to mother a child. But I couldn’t take it anymore after reading half the book. So much so that I skimmed until the end. Not only that, I felt like the author took the Jaycee Dugard story, then fictionalized it. I scanned the book’s website to find a reference to Jaycee’s story, but did not. I guess that was a little upsetting for me. I felt like the author was clearly taking a real life news item and calling it her own.